Flavor, that is. And lots of it. At Perimeter, On the Go products are one of our specialties. When we posted our predictions for 2013 Packaging Trends, growth in the on-the-go products in the beverage category was certainly a trend we expect to see growing even more this year. Last month, Crystal Light launched their new Crystal Light Liquid product, a new, portable liquid concentrate for flavoring water. It is available in six flavors: Strawberry Lemonade, Blueberry Raspberry, Iced Tea, Mango Passionfruit, Peach Bellini and Pomtini. “Crystal Light Liquid serves up the classic flavors from Crystal Light women know and love, with a modern twist. The re-sealable 24-serving bottles make it easy to enjoy a delicious drink anywhere, any time,” said Adam Butler, Senior Brand Manager for Crystal Light in the product’s press release. The release of Crystal Light Liquid comes on the heels of the explosively popular MiO liquid water enhancer. Kraft Foods, owner of both Crystal Light and the popular MiO brand, has since expanded to eleven different flavors of MiO, including Cherry Blackberry, Blueberry Lemonade, Sweet Tea and Mango Peach. Since the launch of Mio Liquid Enhancer by Kraft in 2011, new products in the concentrated liquid beverage category continue to appear on shelf at a rapid pace. 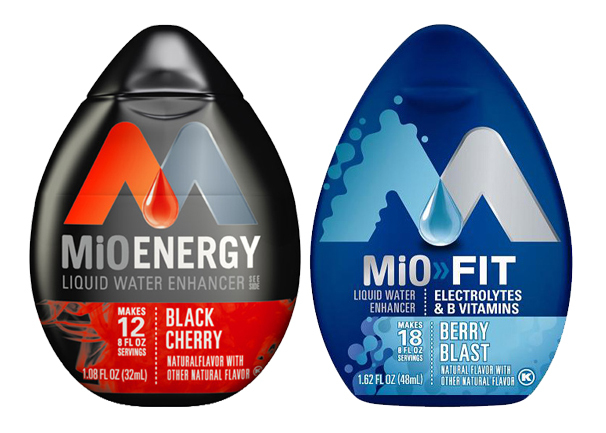 In the last six months, the MiO brand has released two line extensions – for energy drink lovers, MiOEnergy was released in December 2012, and for sports drink fanatics, MiOFit was launched February 2013. “This game-changing, electrolyte-enhanced extension of MiO liquid water enhancer will … tell Americans they have the power to turn their water into a zero-calorie personalized sports drink,” said a Kraft representative in the MiO Fit press release. Other companies have been quick to follow suit, such as Dasani Drops, which was released by Coca Cola in September 2012. Even Private Label brands are also quickly following suit with the liquid on the go packaging, like Walmart’s Great Value brand, and the Target’s Market Pantry brand. Who will be the next beverage brands to release a liquid concentrate in 2013?